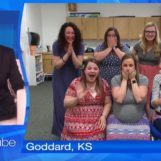 GODDARD, Kan. (AP) — Pregnancy is contagious at one Kansas elementary school, where seven teachers were expecting at the same time, catching the attention of Ellen DeGeneres. The teachers’ pregnancies began getting attention last month when Oak Street Elementary in the Wichita suburb of Goddard posted a photo on Facebook of the women showing off their bulging bellies. The district said the school’s kindergarten classes of 2024-2025 are “growing by the day.” Two of the teachers later delivered within a day of each other while just two rooms apart in the same hospital. One teacher is expecting twins.